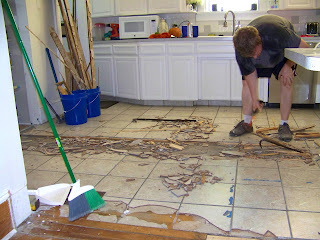 We had popped up a few tiles around the kitchen awhile back and found that there was hardwood under the tile. 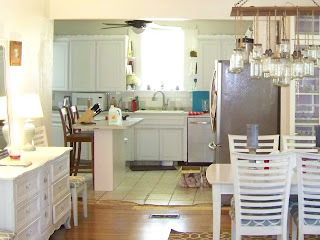 This gave us hope that we would be able to pull up the tile and save the wood by refinishing it. Unfortunately, it quickly became clear that the hardwood was pretty damaged and it would take WEEKS to pull up the tile from the wood so we made the decision to pull up the wood with the tile. Pulling up the wood with the tile proved to be a faster task but still pretty difficult so it took many hours and a lot of breaks to finish but eventually, everything came up. And once all the debris was cleaned up, we put a new subfloor down. We decided which plywood to put down based on the thickness of the floor we want to use. 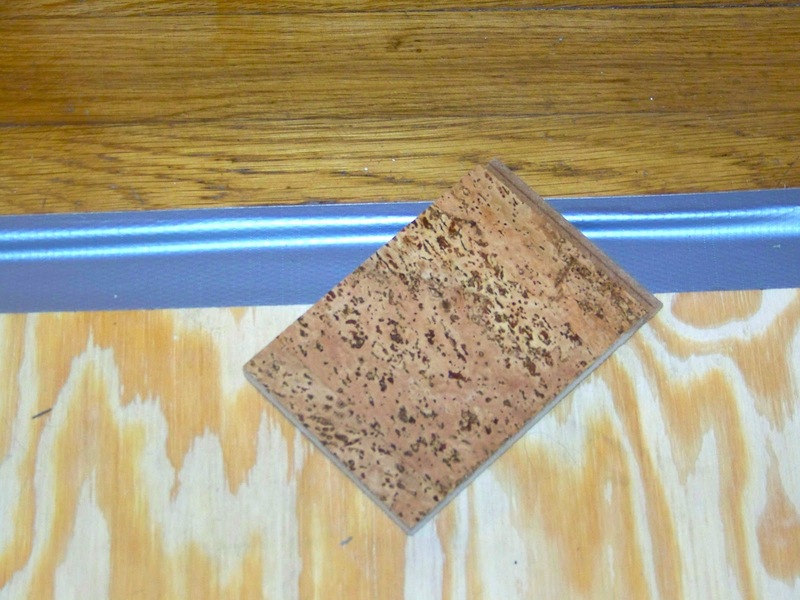 We decided to use cork in the kitchen (in the sample below) that is similar in coloring to our hardwoods but is distinct enough to stand on it's own. 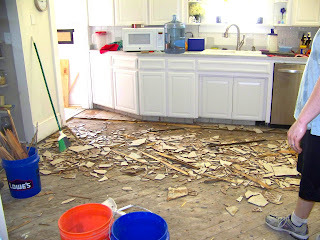 With the thickness of the cork and the plywood, the level of the kitchen floor should be the same as the hardwood which will be a huge improvement over the tile sitting on top of the wood. The plywood is going to stay as the floor for a bit (we put a big rug over it so it doesn't get damaged) until we do a bit more with the kitchen and can pull out the rest of the cabinets. Our goal is to have a working kitchen through most of the renovation so by pulling up most of the floor now, we will be able to drastically cut down on the amount of time all the cabinets will need to be out of the kitchen. 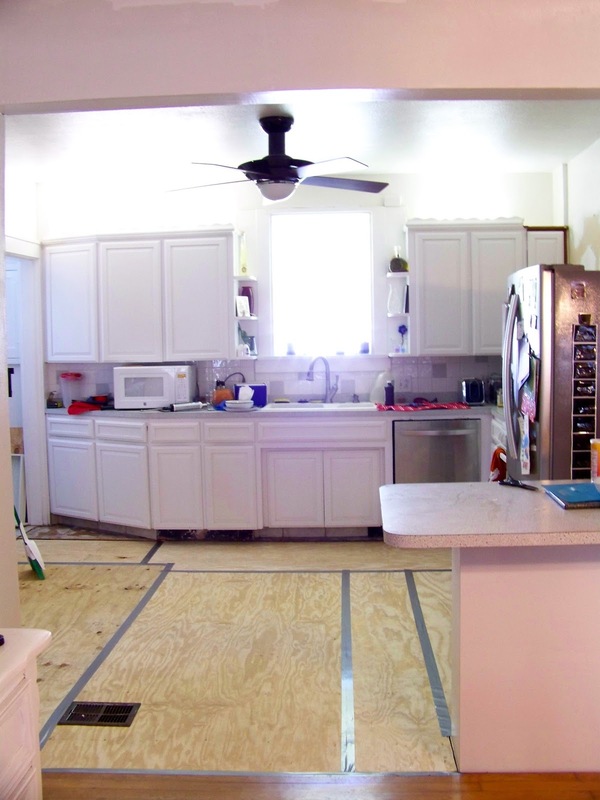 What I find almost hilarious is how much more I like our kitchen with the plywood as the floor. The tiles before were a dirty white color but the plywood makes the room so much brighter (at least to me). 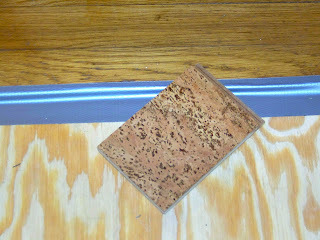 I'm excited that the cork will split the difference, color wise, between the plywood and the wood floor. Just for comparison sake, here is the before and after. You may also notice the rearrangement of the kitchen. I'll get into that later this week but I can tell you now it is working really well! Y'all are young. You can do it!! !